Laker Jim: When you think about Fletch, what comes to mind? Paul Myerberg: The strong impression I have from working on Fletch was the director, Michael Ritchie. Michael was one of the nicest people you'd ever want to work with. Aside from being a gentleman, he knows what he's doing on a set, which makes everyone's job easier. Laker Jim: I'm sure you heard the sad news a while back that Michael Ritchie passed away...it is a great memory of him that you have....something nice you'll never forget. Paul Myerberg: No, I hadn't heard about Michael. That's too bad. I spoke with him several years ago when he was about to start another film (I don't remember which). Laker Jim:Did you ever have a run-in with Chevy? Tim Matheson? anyone else besides Ritchie? Paul Myerberg: By run-in do you mean a negative situation? 'cause I never had a run-in with anyone on the show. Lots of professionals. I wasn't aware of anyone with an ax to grind. Chevy was great to work with and, of course, a big basketball fan even then. We also put basketball stuff in his apartment - a huge cut out as I remember (it's a long time ago). 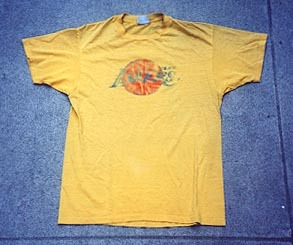 Laker Jim: I noticed you have a prop Laker shirt on ebay from the movie...Do you have anything else from the movie? And did that shirt ever make it on camera? Paul Myerberg: The big question. Someone else asked as well. That's for a future hunt. I don't know if the shirt was on camera. It was on his chair in the newspaper office. I imagine if he was sitting on it, you wouldn't see it but if he was standing you might. Laker Jim: Do you ever watch Fletch? Are you a big FLETCH fan? Paul Myerberg: I love Fletch. It's still an excellent movie which has lost nothing over the years. It's been at least a year since I've seen it. Laker Jim:If so, what do you think of Kevin Smith's new Fletch Movie he's making...Fletch Won? Paul Myerberg: I know nothing about the new movie but I confess to wonder why Hollywood can't come up with more original ideas rather than recycling the old. In so many cases the first one is completely superior to the new - consider Psycho. What's next "Lawrence of Arabia, 2004"? I do hope Fletch Won lives up to it's family tree. Laker Jim: Being a Fletch fan, Do you mind that he's using a younger actor (Jason Lee) to play a younger Fletch instead of Chevy? Paul Myerberg: I'd think that would be the case. Like My Favorite Martian. But I wouldn't be surprised to see Chevy in the film somewhere. Paul Myerberg: I'm currently on CSI, Crime Scene Investigation, and am very happy where I am. Kevin Smith does interesting work. In fact I watched Dogma last night. Laker Jim: How exactly does your job work...Did Ritchie say make it look like a Die-Hard Laker fan would have his place...or does he say "I want a huge Magic cut out here...a hoop there..or get a picture of Coop and Magic? Paul Myerberg: I was what's called the "Lead Man," or Lead Set Dresser, under Marvin March who was the Set Decorator. We were responsible for renting, purchasing, or otherwise getting our hands on, all of the furniture, pictures, smaller accessories, garbage cans, kitchen equipment, you-name-it, that went into each set to make it appropriate for the film. If you look around your room, everything that isn't part of the structure (walls, windows, doors...) is set dressing, including the computer you're reading this on. Michael trusted Marvin pretty much. In general a director might ask for something specific but not always. A Production Designer will also tell a set decorator his vision for a set and expect those standards to be met. Laker Jim: During filming, are you on call incase something was needed? Paul Myerberg: After we finished a set, we'd try to get Michael to come by when he was available. That way, if something needed to be changed it could be done with a reasonable amount of time to accomplish the task. Then we'd be there when the shooting company arrived. They'd rehearse and if something needed to be tweaked, we'd do it. Once the camera rolled for the first take, we'd leave and go to the next set. Any changes after that belonged to the prop master. After the shooting was complete and they got a negative check from the film lab, we'd take out our things and restore the property. Laker Jim: Were you responsible for that huge picture of that weird looking little dog above Fletch's bed? Paul Myerberg: I remember the picture but I don't remember how it got there. If I had to guess, I'd say Marvin ordered it and we hung it. Laker Jim: What do you think of this site? Paul Myerberg: The site is great. I hadn't seen the script for many years. Reading the first section brought back memories. Laker Jim: Paul thanks so much for your time. This was great! Paul Myerberg: Thanks for the interest.